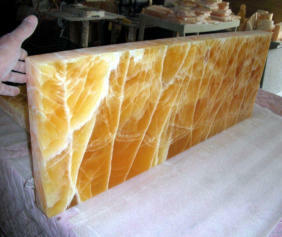 Honeycomb Calcite is a stable carbonate mineral of calcium carbonate (CaCO3). 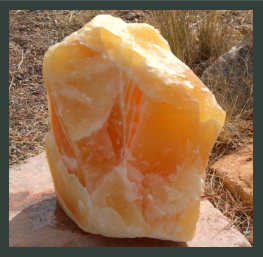 Properties of the stone can be found below under ‘Physical Properties of Honeycomb Calcite.” Honeycomb Calcite is a crystal form of calcite that is transparent and translucent. It is different from other minerals such as Onyx and Alabaster. The crystals that make up a stone are each contained in a ‘cell’ of white dense calcite, thus producing the honeycomb look or other patterns (see photographic examples under ‘Typical Stone Patterns’ below). The translucent nature of the stone, is derived from its crystal structure which passes light from one crystal to the next; and the corresponding refracted light illuminates adjacent crystals. Within the stone, varying thickness of the white calcite makes-up the boundary each cell and effects how the individual crystals in each cell hold or reduce light. This allows each cell to stand-out visually. Color is related to concentrations of Sulfur and Iron during the stone’s formation. Variation in color is correlated with the stone’s thickness. 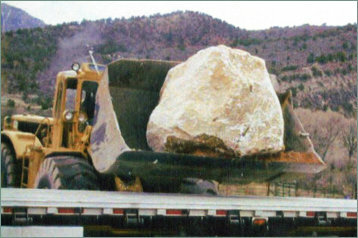 The thinner the stone is cut the lighter the color – the thicker the stone the darker, richer the color. The color ranges from sunshine lemon yellow glow to a golden-honey, or, a rich amber. 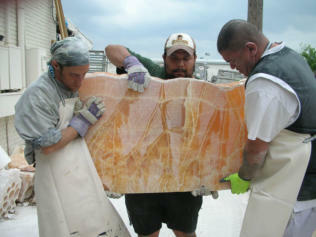 This combination of color and light transmission through the stone’s cells are the basis of Honeycomb Calcite’s beauty. 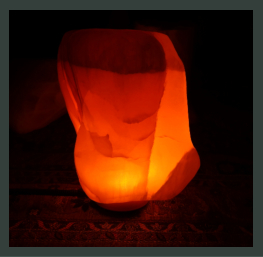 Every stone is unique and the customer is encouraged to experiment with illuminating the stone with natural lighting, candles, a custom lighting arrangement to your personal satisfaction. For almost all cored-cylinders 10” or below in height, a single votive candle inside the cylinder will illuminate the entire stone. Slabs, tiles, sconces, chandeliers or sculptures, may require a custom lighting arrangement if natural lighting is not the intended illumination of the piece.